Increasingly, families are providing long-term home care for the elderly, especially aging parents who become less and less able to perform tasks necessary for independent living. The need to care for someone on a regular basis often leads to stress and other problems for the caregiver as well as the one receiving the care. Caregivers often are raising families at the same time they are helping an older family member and that can affect the siblings, spouses, children and grandchildren of the caregivers. Sometimes it seems as if everything in the family revolves around the health concerns of one person. This can lead many people in the family to feel like health problems have taken over family life. When this happens, needs for attention go unmet and relationships that were doing well before may become stressed. Often, family members who are not providing direct care to elders feel guilty for expressing their own needs in the face of family struggles. When needs go unmet for a long time, unexpected problems may occur. Husbands and wives may feel more distant and intimacy suffers. Conflicts that were tolerated before can become more heated, as people are more tired and frustrated. Children can develop academic or behavior problems that require more energy at a time when less is available. 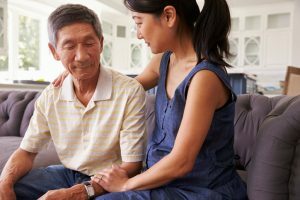 While much has been written about family disputes over what kind of care is needed for elderly family members and who can and should provide it, little light has been shed on how family disputes affect seniors. Elderly parents hate knowing they’re “causing anybody any trouble” and hate to be the cause of rifts. Very often they remain silent, not wanting to “rock the boat” or create more strife than there already is. They internalize the problems and grow increasingly anxious and worried, which in turn can have a deepening negative affect on their mental and physical health. Ensure that everyone gets their say: Feeling unheard is a quick way for an argument or disagreement to escalate, so you can suggest that each family member takes a turn to explain their thoughts and feelings on the situation. That way, everyone feels like they’ve gotten their say, and a discussion can begin. Suggest compassion: In a disagreement, it can be easy to focus only on one side, but remind the family that it’s important to try and see the other person’s side as well. Having compassion for the other individual’s feelings might make it easier to find some middle ground. Promote compromise: When individuals argue or disagree, it’s important to find a way to compromise and move past the issue. Neither person will end up getting exactly what he or she wants, but with a compromise, both can find a way to be happy enough to get past the issue. Resolving disputes can be challenging and requires both hard work and compromise. But when the health and wellbeing of a family member is at stake, resolution is well worth it. If you sense that an elderly or infirm loved one is suffering because of a family disagreement, make the effort to address it immediately. You – and your entire family – will be glad you did. This entry was posted in Caregivers, Tips and tagged depression, family care, family disagreement. Bookmark the permalink. Both comments and trackbacks are currently closed.